The Command-Query Responsibility Separation pattern (CQRS) is a recent pattern that is gaining popularity. In this post I’ll briefly explain the CQRS pattern and show an example of it in a Windows Azure solution that also uses MVC4 & ASP.NET Web API. The demo application, DocShare, allows documents to be stored and read from blob storage. There are two separate UIs and web services for queries (reading) and commands (writing). My online sample is at http://mydocshare.cloudapp.net (query on port 80, command on port 8080). The command site is password-secured so I can control who posts new documents. The source code is on CodePlex at http://docshare.codeplex.com. 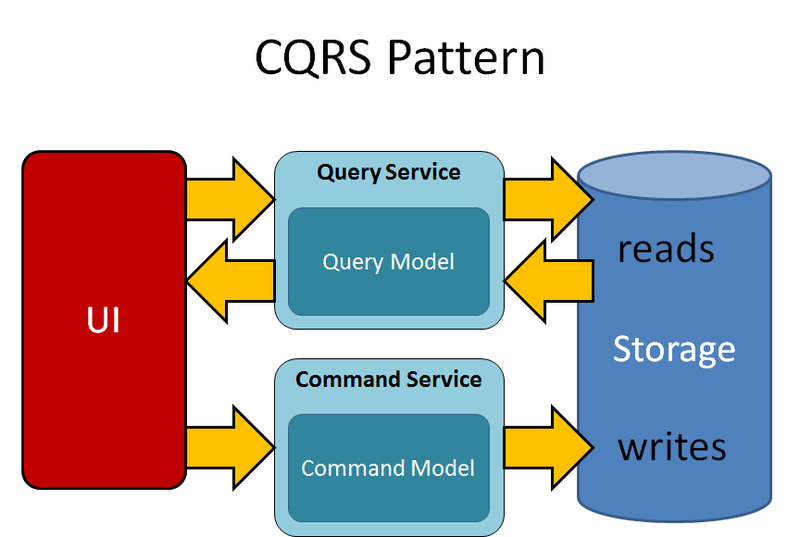 The concept behind CQRS is a simple one: instead of a single CRUD-style interface for querying and updating application data, queries and commands are implemented separately. In short, reading and writing are independent. The pattern is simple enough to understand and implement, but the profound benefits that come from using it may not be obvious at first glance. • More Granular Scale. You can scale read and write implementations separately. You probably don’t have the same amount of reads as you do writes. • Best-of-Breed Approaches. Once you come to grips with implementing reading and writing separately, you realize you can use different data models and approaches for each. For example, you might take advantage of caching, CDNs, or data snapshots in your read implementation. • Simpler Code. A combined interface for reads and writes can often be complex. Separating them affords simplicity. • Safety. The query implementation is by definition free of side effects. You can’t accidentally update or modify data when calling it. In a single CRUD-interface, accidental updates are a real possibility if something is wrong in the calling code. 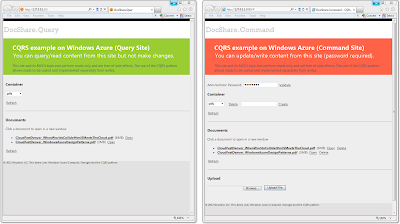 DocShare is a Windows Azure solution for simple document management that consists of two web roles, DocShare.Query and DocShare.Command. The DocShare.Query UI and underlying web service can be used to browse and open documents (files in blob storage); DocShare.Command adds the ability to create/delete containers and upload/delete documents. DocShare stores documents (files) in blob storage. Since the reading and writing are in different web roles, this gives us flexibility in implementation approach and scale. To scale the query or command implementation, simply change the number instances assigned to each web role. This can be done initially in the service management configuration for each role, and can be changed over time in the Windows Azure Management Portal. In the configuration shown below, there are 4 query (read) servers and 2 command (write) servers. 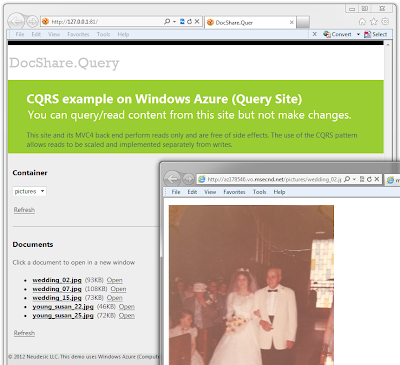 The Query implementation runs in a dedicated web role, DocShare.Query. In the Query implementation, the UI allows users to select a container and see the documents in the container. A document can be clicked to open it in another window. The reads are routed through the Windows Azure CDN, which aids performance with locale-based edge caching. at read time once adjusted to use the assigned prefix for the CDN. The Web API web service for the query implementation is shown below, QueryController. It provides two methods, GetContainers and GetDocuments. Note the use of Get in the method name, which in Web API means an HTTP GET operation will be used to access them. // /Query/GetContainers - Return a list of document containers. // /Query/GetDocuments - Return a list of documents in a container. The controller uses a DocumentDirectory class to do its work. The IDocumentQuery interface, DocumentDescription object, and DocumentDirectory class are shown below. // Document Query Interface. There are no side-effects to using this interface; no data is changed. // Return a list of document containers. // Return a list of document descriptions enumerating the documents in a container. // A DocumentDescription contains all the metadata about a document and a link to its content. // Document Command Interface. This interface modifies content. // Create a document container. Return true if successful. // Return an array of document descriptions enumerating the documents in a container. // Convert a Blob URI into a CDN URI. 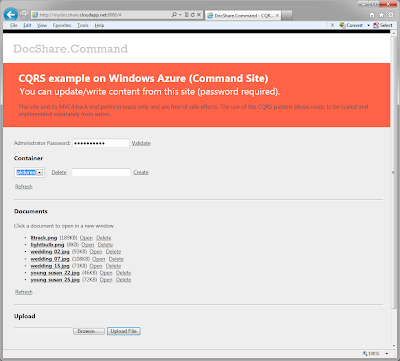 The Command implementation also runs in a dedicated web role, DocShare.Command. Although a purist interpretataion of CQRS might forbid any use of the query interface on the command side, I often find it useful to provide read/write capability on the command side. In the Command implementation, the UI allows users to do what the query interface does as well as create/delete a container or upload/delete a document. It is password-protected to limit who can perform updates. Whereas reads have been going through the CDN, writes go directly to blob storage. The Web API web service for the command implementation is shown below, CommandController. It provides three update methods: PostContainer, DeleteContainer and DeleteDocument. By all rights there should also be a PostDocument method, but in my sample I ended up implementing that in the view because I wasn’t quite sure how to make an HTTP file upload work against the Web API; but that’s something I expect to correct in good time. Again note the use of HTTP VERBS in Web API method names: Post actions are for creating content, Delete methods are for deleting content. // /Command/GetContainers - Return a list of document containers. // /Command/GetDocuments - Return a list of documents in a container. // /Command/PostContainer - Create a container. // /Command/DeleteContainer/ - Delete a container. // /Command/DeleteDocument/| - Delete a document. // /Command/GetPermissions/password - coarse security - validate an admin password. Return true if accepted. 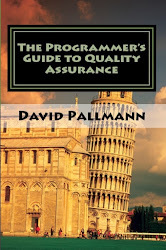 The controller uses a DocumentRepository class to do its work. The IDocumentCommand interface, Document object, and DocumentRepository class are shown below. // Delete a document container. Return true if successful. // Store (create or update) a document. Return true if successful. // Delete a document. Return true if successful. // A DocumentDescription contains a document's metadata and content. 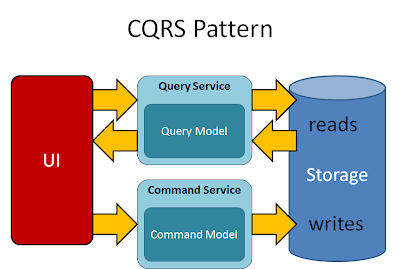 The CQRS pattern provides us with a better factoring of reading and writing than traditional CRUD approaches. It heightens scale, simplicity, and safety. 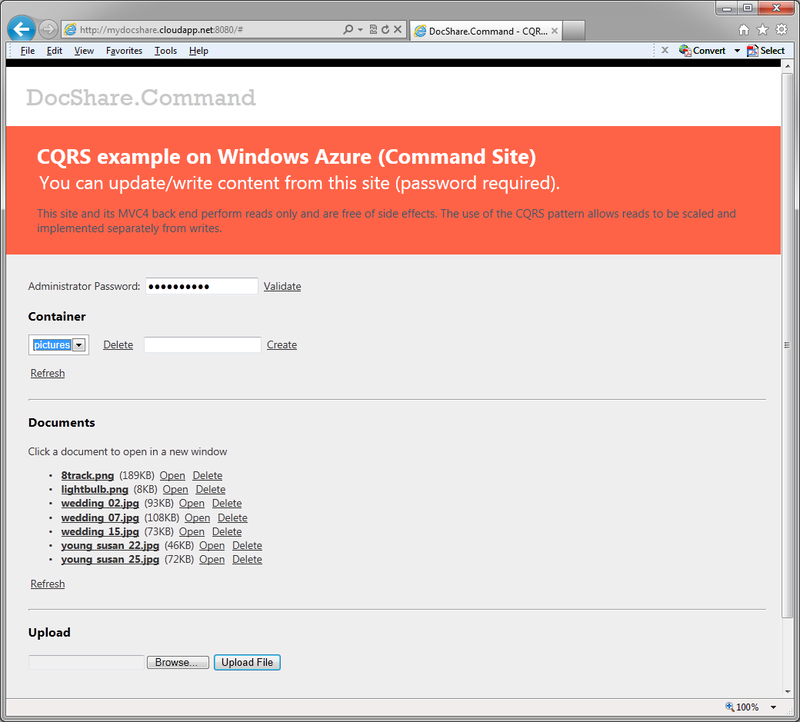 DocShare is one example of this pattern that makes use of Windows Azure and MVC4 Web API. 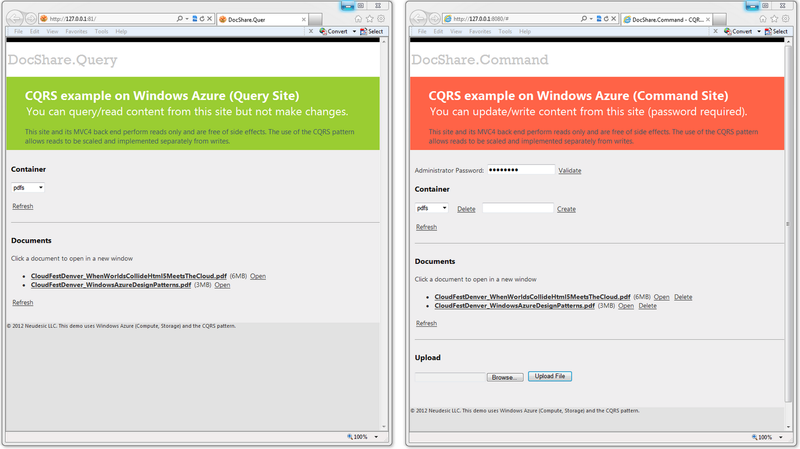 Web roles on Windows Azure provide the separation and independent scale CQRS specifies. MVC4 and Web API also fit the pattern very naturally. Download the code at http://docshare.codeplex.com or visit the online sample at http://mydocshare.cloudapp.net/. William, you can apply CQRS anywhere - there's nothing cloud-specific about it.